Come one, come all, to the greatest race of the year! 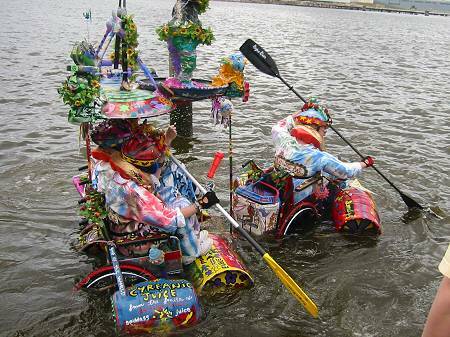 See sculptures scamper through the heart of Baltimore, over road, mud, ice, sand, and out into the harbor! Here are pictures in case you missed the event. 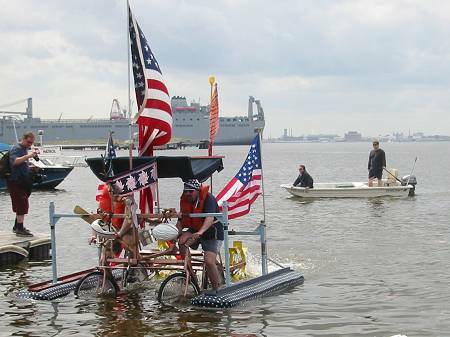 This was the fourth East Coast Kinetic Sculpture Race, and it was even more grand than the previous year (see those photos). 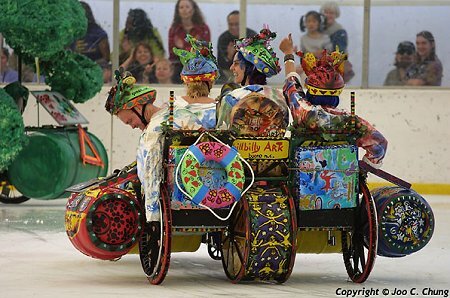 The race was again hosted by the American Visionary Art Museum on the Inner Harbor--a great place to visit even when it's not hosting sculpture races. This year's exhibit, War and Peace, has some amazing and thought-provoking pieces. I went with Karen, Gretchen, Dave and Lisa, and we got good and tired merely following the sculptures along their 15-mile journey. One improvement this year was replacing the inflatable woman and man lasso competition with an ice slalom—see the photos at the bottom of the page. 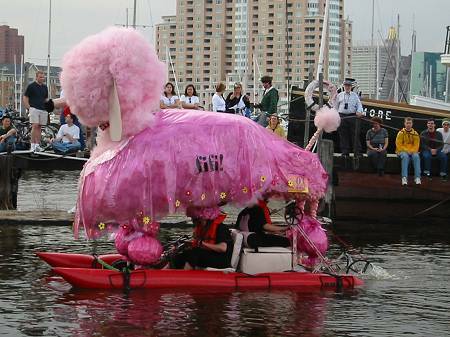 The Visionary Art Museum’s amphibious poodle Fifi was in the race again, although her pink wasn’t quite as bright as last year. She sported a stylish raincoat for the water segments. 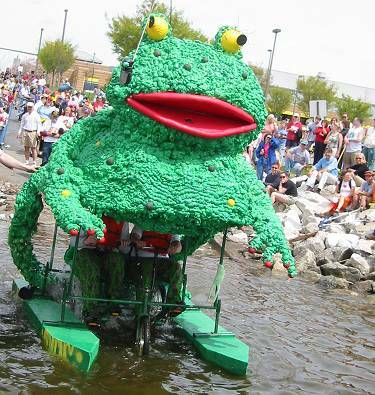 This frog was an amazing 2-pilot pontooned creation that performed admirably on land and sea. 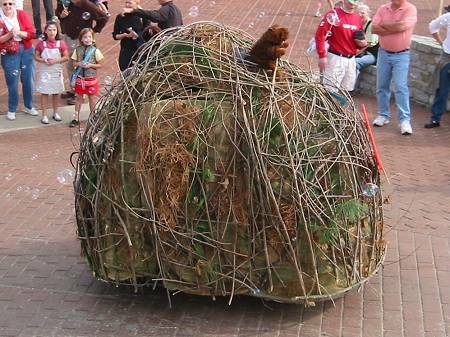 The body of the frog was made of expanding foam insulation extruded over a frame of chicken wire. Colored styrofoam balls were inserted and the whole thing was painted green. A very lightweight, bold construction (albeit slightly disturbing). It came complete with a large fly bobbing on a wire in front. 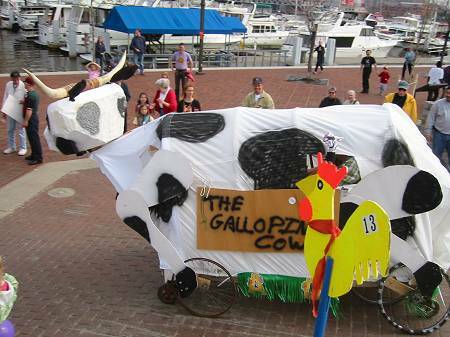 This Galloping Cow was impressive, but apparently difficult to drive. Less than halfway through the race, its two pilots offered it to anyone who wanted to finish the race in it—and under questioning revealed that they themselves had been mere race spectators until recruited by the original pilots some miles earlier! 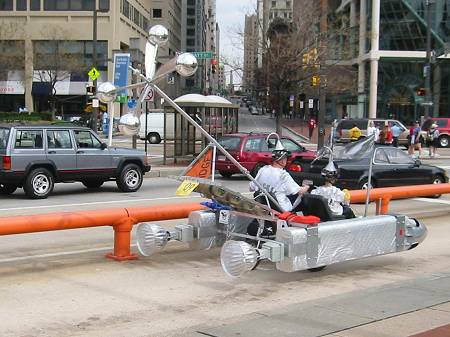 The Rocketmen entry on the streets of Baltimore’s Inner Harbor in the special hovercraft lane. The funnel hats were a great touch. The huge propeller and squirrel cages on the back rotated, but unfortunately did not provide propulsion. They were also at home on the water. 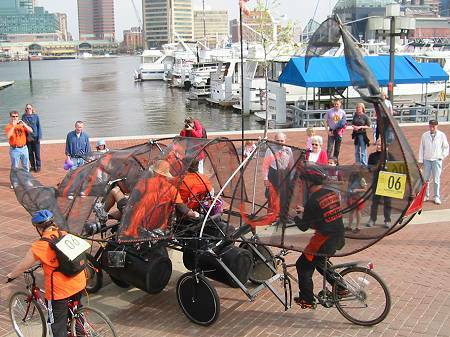 The Towson Dragonfly Divas had a well-tested design that worked well on pavement and in the harbor. The creature’s wings flapped with abundant festivity as it went along. The Divas had a bit of trouble in the sand, but their lightweight design kept them from bogging down nearly as much as most sculptures. This patriotic entrant was a clean engineering design festooned with flags big enough to be sails. They didn't have an easy time steering in the water, but were effective. 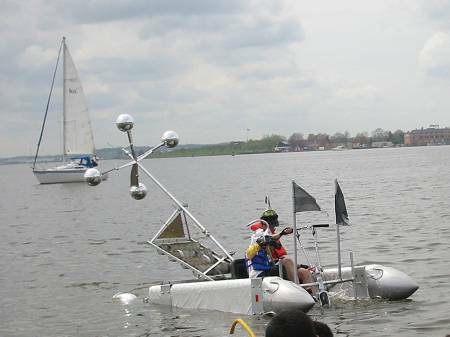 This pontoon design was generally effective, although it required a lot of fiddling at transition points. 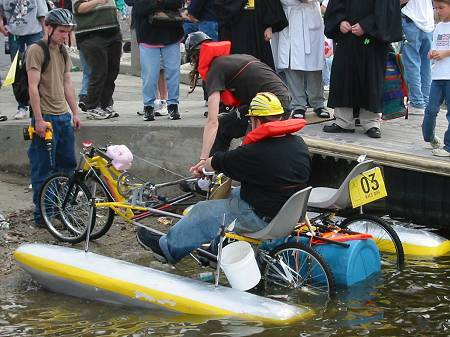 If the front wheels aren't drive wheels, and the floats aren’t carefully positioned, buoyancy will make it impossible to drive out of the water. Most sculptures needed towing or pushing on their aquatic egress. Designing something to drive through mud is hard! Even this fat-tired creation needed a lot of pushing to get through. 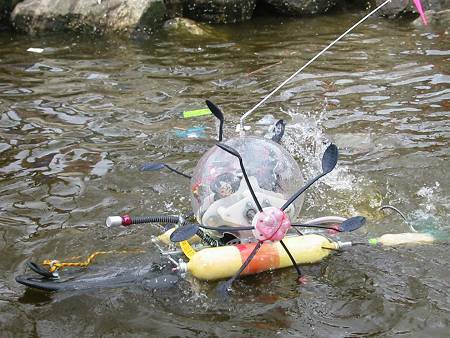 RE-Me2 the Radio Controlled Swimmer was Pilot Frank Lee wearing a giant transparent helmet while leading a rickshaw-style boat launcher with bamboo poles. 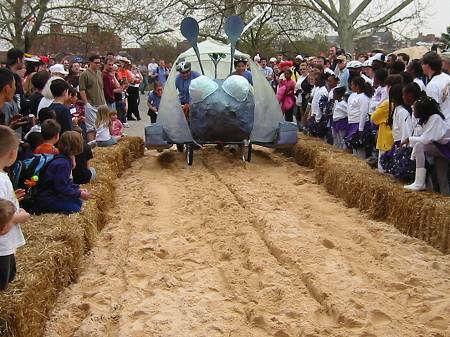 The cart turned into a remote-controlled spoon-driven boat for the water race. Frank had plenty of bribes on hand to keep his body out of the harbor. More about this entry. This was an incredible mobile beaver lodge to match last year's beavercycle. The pilot of this amazing sculpture rode a bicycle inside, and had a hole through which he poked a beaver puppet that waved to the crowds. As the lodge scurried around, it was impossible not to laugh. It’s a comic work of art. This pilot had an extraordinarily effective design. He had sturdy mountain-bike tires, very little mass, and just drove into the water and activated his rear propeller. He had the incredible ability to drive right out of the water, which is utterly impossible for almost any other design. This engineering feat makes up for its naked artless functionality. Just as impressive, he also drove straight down the steep ramp at the Museum of Industry, and was one of only two sculptures that didn’t require careful lowering on ropes by a large team. Incredible! 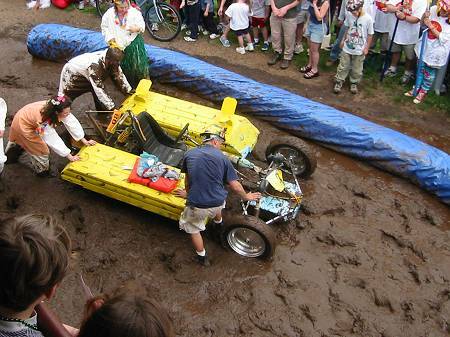 After the racecraft arrived at the site, there was a lengthy delay while they figured out how to let the craft enter. 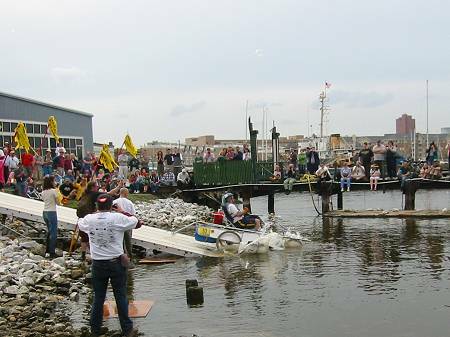 Eyeing the steepness of the ramp and the sudden dropoff in the water, many in the crowd anticipated sculptural carnage until they started using ropes to gingerly lower vehicles into the water. That made the few craft that drove straight down all the more impressive. This scorpion was another clever design, quite close to its roots as a collection of mountain bikes fastened together. They were the only entry that had not mere pit crew, but also a cheering squad! 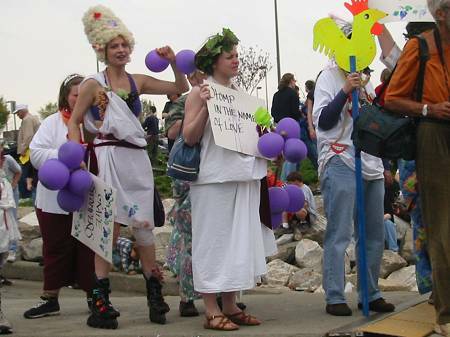 Rollerblade-clad enthusiastic supporters held bunches of grape-like balloons to show their vinicultural spirit. (Holly’s indomitable nature is also reflected in the bandage on her left knee, and the matching blood stains on her toga.) 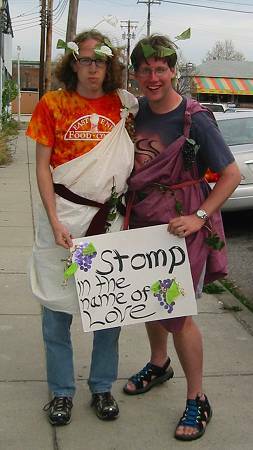 To top it off, they were approaching spectators and converting them to their cause by applying togas, wreaths, and signs! This is what Dave and I looked like after they converted us. Note my inadvertent choice of matching shirt and sandals. Dave doesn't always look like that. This craft may look something that fell off a barge, but it worked quite well. 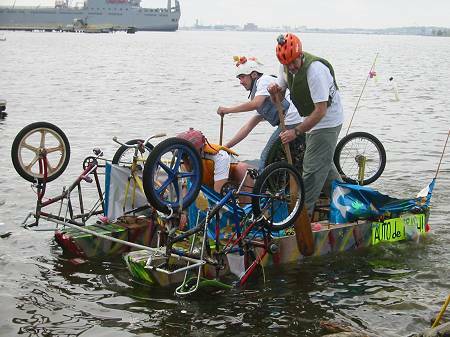 Their one big problem was on Canton Waterfront loop around the pier, where a piece of floating trash jammed their unicycle-style propeller. Cleverly disguised as a superfund site, this sculpture was the most archetypically Visionary entrant in the race. With hand-painted lettering and primary-color palette, it looked like it had rolled right out of the Visionary Art Museum. 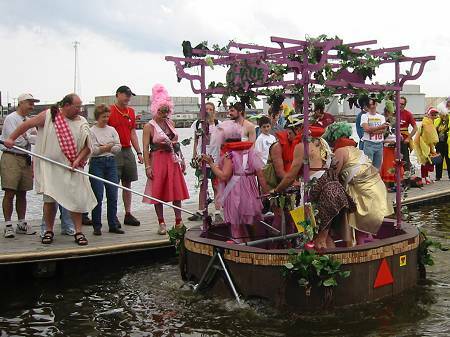 It's chassis consisted of three wheelchairs fastened together, floated by nine beer kegs (presumably empty). 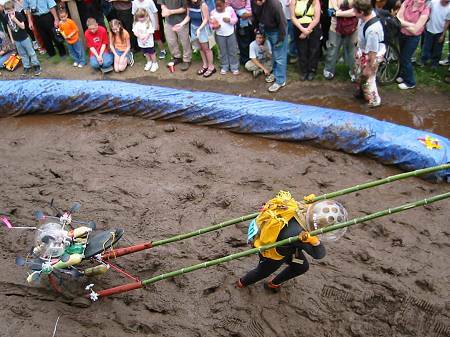 It required nine people to get through the mud! 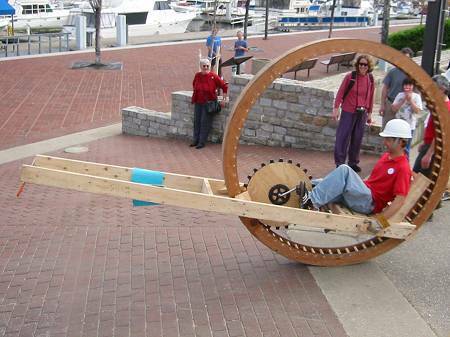 This represents the most elegant and fantastic example of mobile woodworking I've ever seen. Unfortunately, it was extremely difficult to steer. The unsupported front required a huge balancing effort along the pitch axis, and the narrow footprint of the ring required a huge balancing effort along the roll axis. 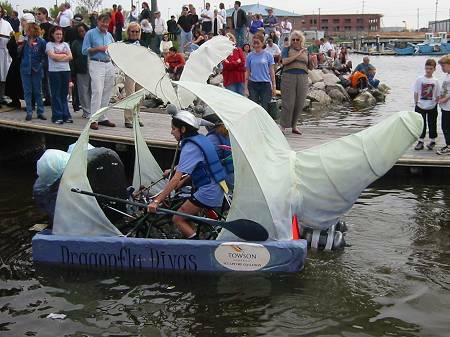 We didn't see this spectacular creation get far past the starting line. 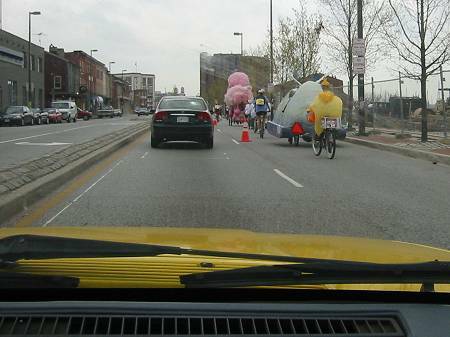 The view from a taxi as we caught up with the racers. We conclude with two photos of the ice crossing at the Patterson Park Ice Rink, courtesy of Joo Chung. 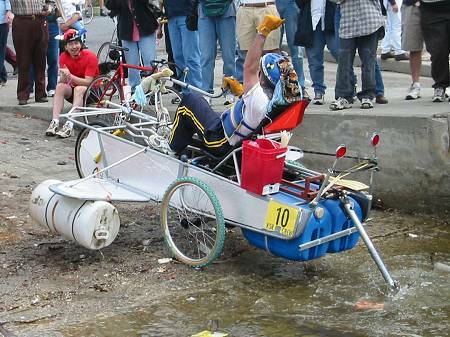 This is the only time in the world-wide history of Kinetic Sculpture Racing that there has been an ice crossing. First we see the Hillbilly Ark from the Dumpster Divers. 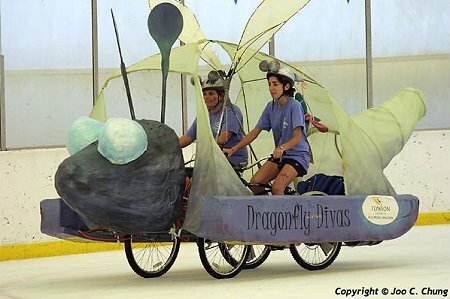 Second, we have the Dragonfly Divas from Towson University as they glide through the rink. 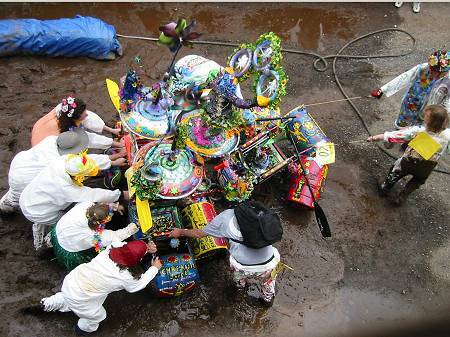 For more photos of this historic icy event, view Joo Chung's photo gallery.